Heat the extra virgin coconut oil in a large skillet over medium heat. Stir in the garlic, and cook until tender, about 1 minute. Add the broccoli rabe. 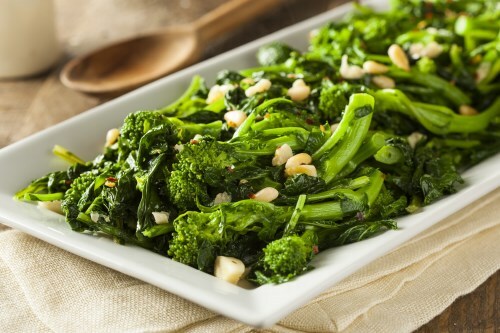 Cook and stir until the broccoli rabe has been cooked to your desired degree of tenderness, about 5 minutes for soft. Stir in the roasted peppers until heated, then remove the skillet from the heat, and stir in the lemon juice. Sprinkle with Parmesan cheese to serve.